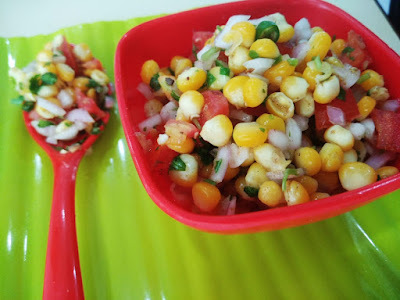 Corn chaat recipe or masala corn recipe with step by step procedure. Corn chaat is an easy snack which you can prepare quickly or whenever you are short of time. Even bachelors can make it as it does not require any cooking expertise. Corn is versatile vegetable (grain) that can be used to prepare so many dishes like soups, sweet corn, cutlets. My favourite way of enjoying corn is to eat a hot corn cob that is grilled on char coal, which is the most common way of consumption in India. 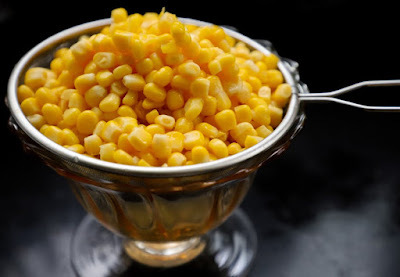 Today's corn chaat is a healthy corn recipe that can be prepared in just 5 mins if you have the boiled corn in hand. Wash corn under running water. If using corn on the cob, soak them in salted wtaer for sometime. Any pesticide residue will just get rinsed well. Boil the corn cobs or corn kernels in large bowl filled with water. If you are using cobs, remove the kernels after boiling, drain water completely. If you are using tender corn, you can alternately steam the corn to retain nutrients. Add all the masala ingredients and toss well. Now, serve corn chaat immediately while hot.